If you’re looking to add a unique twist to your container garden, consider creating a fairy garden. Fairy gardens are quickly becoming a popular pastime for succulent lovers. These miniature container gardens are tiny, whimsical wonderlands built with the vision of what it would look like to someone as small as a fairy. The decorations and plants are all sized with this perception in mind. Your creativity can truly run wild when designing these extraordinary little gardens! Building the miniature garden of your dreams begins with giving in to your imagination… but the first step is considering the container that you’ll be using. Shallow containers are generally recommended as they are easier to work with and tend to limit the growth of the plants. Limiting the growth of your plants will help keep them small and easy to manage. I suggest you prioritize a container with drainage. That’s the best way to ensure your plants stay healthy. If you are dead-set on using a container with no drainage, read up on how to care for succulents in a container with no drainage. Otherwise, consider using smaller pots on top of your larger one to create a tiered garden. Many gardeners find that using broken pots to create the tiers is an excellent way to reuse damaged containers. Once you’ve chosen your container, you can plan your garden by sketching a rough design onto a piece of paper. 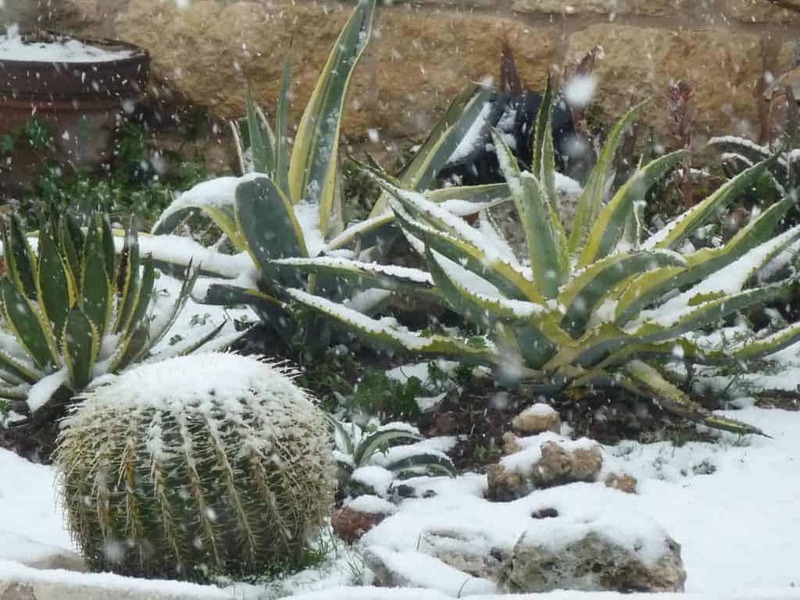 Sketching your garden before starting helps you calculate the number and types of succulents you’ll need as well as what decorations you’d like to use. When deciding which plants go where, remember that placing larger plants toward the back of your garden will help achieve the balance and perspective you’re looking for. The planning stage is also a great time to consider where you’ll be placing your finished garden. Considering the amount of sunlight your garden will be getting will help you to decide which plants to use. Buy a kit like this at The Succulent Source! Click this picture to visit! When choosing your plants, look for succulents on the smaller side. Your local gardening center or online nursery should offer an array of plants in all shapes and sizes. If you already have an impressive succulent collection you can even propagate your own. Ideally, you’ll want a variety of sizes, colors, and textures. Air plants can be another great addition to a fairy garden and look great in tiny pots or hanging containers. Try experimenting with your design by setting different plants next to each other to get an idea of how they’ll look in your finished garden. The choice of accessories and decorations in your garden is limited only by your imagination. Many online retailers offer miniature furniture, decorations, statues, and pots intended specifically for fairy gardens. Interesting rocks and pebbles make wonderful additions to your tiny paradise as well. Some gardeners enjoy building little paths around their garden, while others prefer scenes centered around a tiny cottage. You can incorporate miniature ponds, bridges, and fountains if water features interest you. Many gardeners also enjoy stringing mini lights around their fairy gardens so that they can enjoy them even after the sun has gone down. Fairy gardens are as easy to maintain as any other container garden. The only difference is that you may need to trim your plants on occasion to keep them from taking over your tiny wonderland. This would be a great time to take cuttings to propagate for your next fairy garden or another project. Planting your succulents in a shallow container will help slow their growth, but you’ll still need to keep things tidy. The Succulent Source is an excellent resource for creating the perfect fairy garden. They offer an extensive selection of smaller succulents in a variety of colors, shapes, and sizes. These petite plants are available individually or in sets. They also have an entire section of their store devoted to fairy garden accessories! The little ceramic hedgehogs are my favorite! If you need a few ideas before diving into the world of fairy gardens, visit Miniature Gardening. Their collection of miniature garden accessories is sure to inspire you. They have teensy planters, furniture, garden tools, and cottages. If you’d like your miniature garden to celebrate the current holiday, check out their huge selection of seasonal items. They even have fairy garden kits if your creativity needs a helping hand. If inspiration is what you need, take a look at their photo galleries where you’ll find a plethora of beautiful and unique fairy gardens. Mountain Crest Gardens is a haven for fairy gardeners, both new and more experienced. If you’re just getting started, their website has an introductory video to show you the beauty and endless possibilities that fairy gardens offer. If you’re ready to start your own fairy garden, Mountain Crest Gardens offers an amazing selection of plants, available individually and in sets. Their square and round moss trays are a perfect base to start with. They also offer a variety of décor including miniature gnome statues, tiny fountains, trellises, furniture, and more. If you need ideas they even have a book to help you design your dream garden. Etsy is another great resource for fairy garden plants and decorations. You’ll find everything from exotic succulents in bulk to tiny ceramic forest animals and houses. If you’re still searching the perfect container, there are plenty to choose from, whether you prefer cement, ceramic, wood, or something else entirely. You can find tiny bridges, paving stones, koi ponds, and even miniature lights to make your garden sparkle. If you have a specific item in mind, you’re likely to find it and so much more. Etsy is also a great place to look if you aren’t quite sure what types of plants or decorations to use in your garden. The vast assortment of options is sure to fuel your creativity. 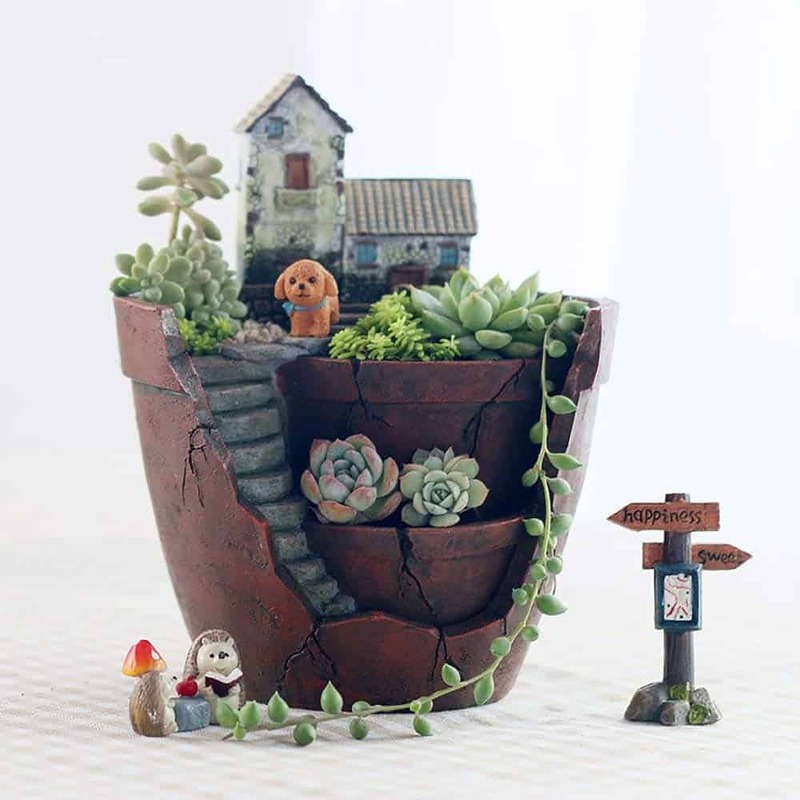 So if you’re tired of the same old container garden and want to add a touch of whimsy to your succulent collection, let your imagination run wild and try building a miniature succulent paradise!